In my continuing selfless service to the world (ahem), I'm always looking for the next awesome thing to stream. And, of course, I must share my finds with you fabulous folks. Hence, Stream-It Saturday. Check out all my previous recommendations over here. Manhattan is the little show no one heard of when it debuted last year on WGN. The drama is set in 1940s Los Alamos, New Mexico and focuses on both family life in this weird little outpost and the professional drama among the scientists working on the Manhattan Project. 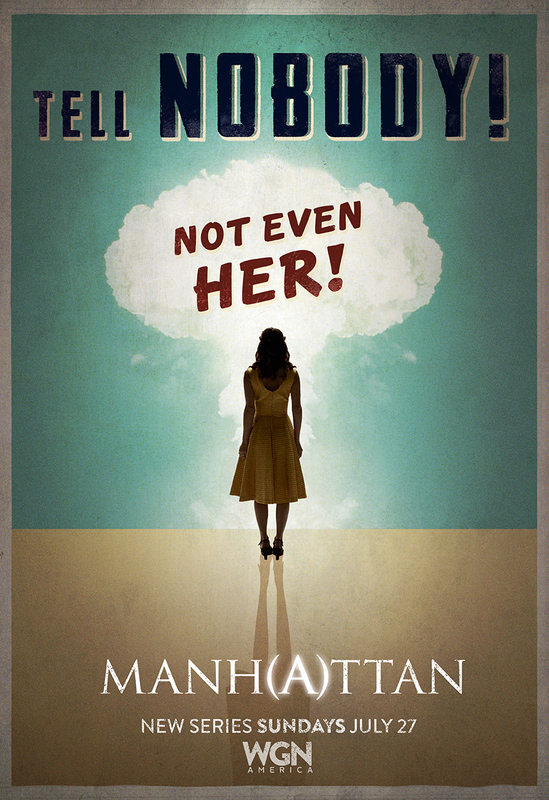 I ended up watching the entire first season of Manhattan over a weekend (I was sick, I have an excuse) and was absolutely engrossed. First of all, I liked in Northern New Mexico, and as part of one of my jobs visited the Los Alamos National Lab and the town of Los Alamos fairly frequently. That place is weird as hell, I tell you. What I loved about this show is it really shows the weird roots of that place. Let's face it, you get a bunch of the world's best scientists together in one place, you've got a recipe for the bizarre. Then, you layer the requirement of secrecy--even from one's own family--required of many of the lab occupations, a very odd culture results. More generally speaking, the thing I love about this little show is that it takes a small view of a big event. Most of us have seen the movie Fat Man and Little Boy, which looks at the big stuff around the development of the first atomic bombs, but Manhattan looks at the intimate moments: Families struggling in this strange world, scientists whose belief in their own rightness takes over for the sense of right and wrong, and the lies, lies, lies that permeate this world. Manhattan could easily be a show populated by Problems of Important Men, but it's the women in this show that are the most compelling. Olivia Williams' (who I like in everything she does) character is the wife of one the group leads (Frank, who's ostensibly the story's lead), but is actually a respected scientist--a botanist--in her own right. Helen Prins, played by Dutch actress Katja Herbers, is one of the few female scientists on the project and she's rather unexpected. (Women did work on the Manhattan Project, incidentally.) The relationships between the women of Los Alamos are equally riveting and go in directions I didn't expect. It was a surprise to me, but this actually ended up being one of my favorite shows of last year--with the exception of the weak, overly-expository pilot, Manhattan has the feel of a slow-moving novel with quietly-building tension. You know, the sort of story that sneaks up on you. It was renewed for a second season coming next summer, and I can't wait to see where it goes. There aren't a lot of "quiet" shows on television these days, so it's refreshing that the Manhattan producers took a major event in world history and chose to make it a quieter human drama. (Also fascinating: There's a certain corner of the internet that's Extremely Upset about this.) Since the ending of the series is in many ways predetermined due to history, the route to the inevitable ending through the lens of these characters is the story and there are so many directions it could go. Manhattan is available on on-demand and is streaming on Hulu.